Sheltone is available at a special discount price as part of our Reed Organs bundle. See our Hot Deals page to grab this offer. If you’re looking for something a little left-field to add real organic warmth to your pads, or a uniquely textural lead sound, or an old-school roots vibe to your Reggae, Sheltone might just fit the bill. 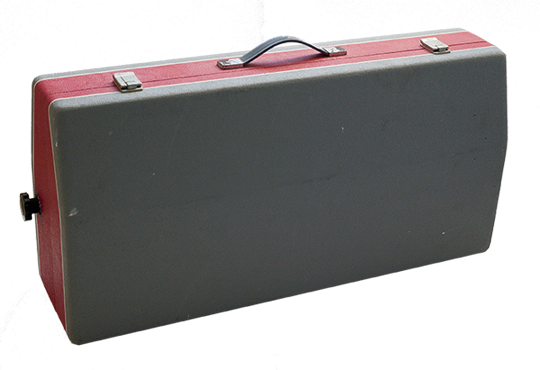 The ShelTone 226 is a cool electric reed organ built into a tolex suitcase. It makes its sounds by using an electric fan to drive air over reeds, much in the style of a harmonium or accordion. As well as three octaves of keys, the original 226 boasts a set of Bass Note buttons to the left of the keyboard, plus two sets of Chord buttons – one major set, one minor set. You don’t get all the bass notes and chords of a full octave, though, just a selection, which limits playing on the original keyboard to certain keys (basically C, D, G, A and F). The great thing about the ShelTone is its warm, reedy, breathy quality of sound. It’s simply more organic than most organs, with a rich, throaty sound in the bass and a keen, driving treble. With all its settings left on “natural”, it sits effortlessly in folky or alt-folky tunes, and can sound either like an organ or – with a bit of manipulation – like an accordion. But run through some outboard effects, which of course we’ve built right in, the sound can become very different – everything from a 60s mellow mood-setter to much more driving, grungy and aggressive roar that works well for a 70s punk organ sound. It can do that Caribbean thing too, chunking along on the offbeat of your Bob Marley tributes. We’ve taken advantage of the sampling process to take things that bit further. The Bass Note buttons have been incorporated seamlessly into the keyboard samples so you get a full key range instead of just three octaves. If you want to play with those Major and Minor chord buttons, simply click the Bass Chords switch to swap from a full key range to a split keyboard: single notes on the right, and two octaves of Major and Minor chords under your left hand. (The Chord buttons on the original 226 engage a totally different set of reeds that sound noticeably different, so they have a kind of fuzzy warm character all of their own and are well worth experimenting with.) And very importantly, you can choose whether to have the fan noise on or off, and the level at which it sounds, for authenticity or sound-design. Of course we’ve also put some choice effects in the signal path: Chorus, Tube saturation, some good old-fashioned shouty distortion, a rotary speaker and a nice 1960s speaker cab to round off the high ends and bring everything together. We’ve even got Attack and Release controls so you can roll your own pad sounds instantly: the Release control kicks in a little bit of pitch drop-off as the note fades, which emulates what happens when you very slowly release a key on the original board (the vibrating reed slows as the airflow drops, and pitch falls away as a result). It’s very cool and it sounds great. 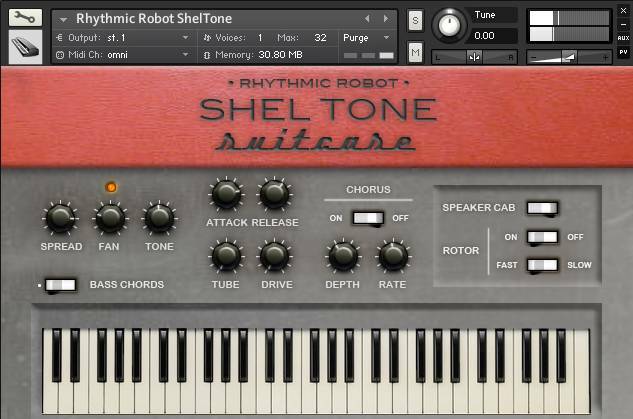 Sheltone isn’t supposed to knock your B3 emulation off its pedestal, but it’s a lovely unusual and warm sound to have in your sonic arsenal. And if comes with its own suitcase, which is pretty neat. Just don’t forget to pack your mojo. Under review here is Keyboard Vault, which is made up of 24‑bit mono samples and requires a full version of Kontakt (V4.2.3 is recommended). 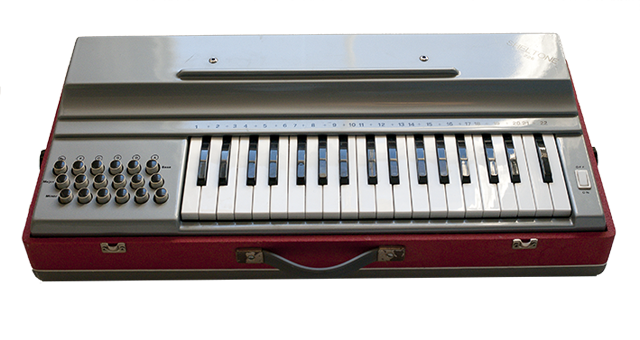 At the time of writing, KV features two simple reed organs, the first of which is the ShelTone, an organ built into a suitcase, with an electric fan that blows air over its reeds. Rhythmic Robot have, of course, sampled the fan separately, so you can have as much or as little of it as you want. This is a warm and appealing little keyboard, its reedy tones and modest attack unashamedly accordion‑like. It thoroughly deserves the description \\\’organic\\\’, but does offer some scope to edge away from the folksy, elbow‑patch vibe too. You can add a little dirt via the tube and drive settings or, for more lush, organ‑y textures, turn on the rotary speaker, which speeds up gradually as you click from slow to fast. With a simple but effective chorus thrown in, the ShelTone is more versatile than it first appears. A quick tweak of its attack and release controls lets you push its repertoire as far as lush and fuzzy pads. This is terrific value. Very cool somewhat breezy sound. I get an ABSURD amount of usage out of this guy. Wonderful, three-dimensional tone that, dry, serves as a great pump or reed organ; it also takes chorus/filters and other fx really well, and all the dirt & weirdness you can dial in makes it wonderfully versatile. A just wonderfully evocative sound and, with all due respect to previous reviewer, much more than a 2-3 trick pony; I’ve used it in various ways on (to date) 4-5 film scores and it always seems to find a way in as a wonderfully emotive melodic element. A solid 2-3 trick pony here. I think it could handle folk, funk, and maybe prog-rock duties fairly well–it feels sort of like an accordion-wurli hybrid, with a tiny splash of oboe and maybe a hint of a Seventy-Three… (Crazy, right?) It definitely has some unique dirt to it. The Attack and Release controls are definitely appreciated! Never messed with the bass chords; maybe that’s next. I would’ve dug maybe a sweepable notch-EQ knob or two, but for the money, yeah, I can always add a plug later in the chain. Great stuff!